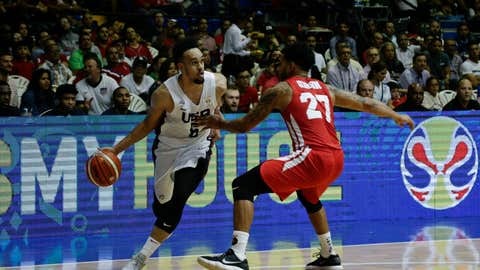 PANAMA CITY (AP) — U.S. coach Jeff Van Gundy came into the start of this second round of qualifying for the FIBA Basketball World Cup cautioning his players that they would face enormous challenges. They clearly heeded his words, and the Americans are now closing in on a trip to China next year. Reggie Hearn scored 12 points, Dwayne Bacon added 10 and the U.S. easily got past Panama 78-48 in a qualifying game Monday night. The Americans have won both of their second-round qualifying games so far, winning them by a combined 87 points. The U.S. outrebounded Panama 50-34, held the hosts to 31 percent shooting and trailed for only 67 seconds in the early moments. Van Gundy went to his bench early and often, rotating players throughout in part because of a steamy feel inside the arena named for Panama’s boxing legend Roberto Duran. And now, Nov. 29 — the next day of qualifying games in the Americas Region — sets up as enormous. The U.S. and Argentina are tied atop Group E with 7-1 records and will play that day with outright control of first place in the group standings up for grabs. Uruguay and Puerto Rico will meet that same day, each entering with 5-3 records, meaning the loser there will be three games behind the U.S.-Argentina winner with three games left in qualifying. The top three teams in Group E are guaranteed spots at the World Cup, which starts in China on Aug. 31. After the way they played Monday, it seems like only a staggering collapse would keep the Americans from qualifying. The U.S. used a 16-0 run — needing only about two minutes — in the fourth quarter to turn what was a relatively one-sided game into an even bigger rout. Chasson Randle, Hearn and Travis Trice all made 3-pointers to get that spurt going, and Ben Moore’s layup with 6:30 left gave the Americans a 73-40 lead. The U.S. got an ideal start in a hostile arena, running out to a 16-3 lead as Panama opened 1 for 11 from the field. The Americans were in control throughout, though there was a brief stretch late in the first half where the U.S. grip on things seemed to slip ever so slightly. Panama got within 31-23 with 2:04 left in the half on a jumper by Tony Bishop Jr. before Hearn and White combined to score the final five points before the break and send the Americans into intermission with a 13-point lead. When the second half started, the U.S. resumed pulling away. Frank Mason, Dakari Johnson and Bacon scored the first six points of the third quarter, and the Americans’ lead was quickly pushed out to 42-23. USA: USA Basketball teams are 21-1 against Panama, when counting play at all international levels. … No U.S. player has scored more than 17 points in any of the eight qualifying games. … Ellenson finished with 11 rebounds, one shy of the most by any U.S. player so far in the qualifying rounds. Panama: Javier Carter led the hosts with 16 points. … CJ Rodriguez finished with 13 points. The September window of games closed with seven of the 32 spots for the FIBA Basketball World Cup filled. China automatically qualified as the host nation. Nigeria and Tunisia claimed two available spots out of the African Qualifiers with wins on Saturday. And four European teams — the Czech Republic, Germany, Greece and Lithuania — all had clinching wins either Sunday or Monday. There were two games in the other group of Americas Qualifiers on Sunday, one going down to the final buzzer and the other never getting started. Venezuela (7-1) topped the Dominican Republic (5-3) 79-78, and Brazil (6-2) was credited with a 20-0 win over the Virgin Islands (2-6) in a forfeit — the Virgin Islands team didn’t make its flights to Brazil. Also in Group F, Canada (7-1) topped Chile (1-7) on Monday, 84-61. All six Group E teams in the Americas were in action Monday. Besides the U.S. win, Uruguay beat Mexico (3-5) 63-60, and Argentina defeated Puerto Rico 106-84. USA: Visit Argentina on Nov. 29. Panama: Host Mexico on Nov. 29.